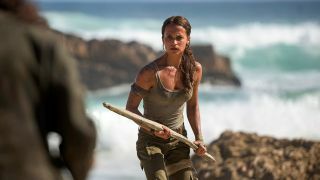 Alicia Vikander will be picking up a bow and arrow to play Lara Croft in the upcoming Tomb Raider movie reboot next year, but she's very aware that she's not the first actress to take on the role of the iconic video game character. At the beginning of the 2018 movie, Lara's backstory has dispensed with the privilege and butlers, and she now works for a bicycle courier company and lives in a communal space while she figures out what she wants to do with her life. It certainly marks a change of pace from the 2001 movie, Lara Croft: Tomb Raider, and its risible 2003 sequel, The Cradle of Life. You’ll get to see the new Lara Croft in action come March 16, 2018, but to tide you over until then why not pick up a copy of the new issue of Total Film which includes on-set interviews with Vikander, Uthaug, and co-stars Walton Goggins and Dominic West? Plus, it also includes a full 2018 movie preview. Pick up the new issue of Total Film magazine when it hits shelves on December 22, 2017 or, better yet, subscribe so you never miss an issue! Doing so will net you a fancy (and very exclusive) subscriber cover, and My Favourite Magazines is currently running a Christmas sale that allows you to save up to 43% on a Total Film subscription!